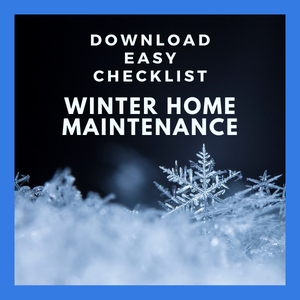 Winter, love it or hate it, is firmly upon us here in the U.S. And whether you're a homeowner or a renter, you're likely concerned with keeping your energy bills down this winter. While you may not have the time or money to tackle a big project like replacing windows or adding insulation, you can utilize some easy, low-cost ways to keep your house warm and reduce your heating bill. Follow along to see if you've checked off this list! 1) Use your programmable thermostat. While many experts recommend setting your thermostat's daytime temp to 68 degrees during the winter to save on energy bills, that may feel too chilly if you tend to being cold-blooded like I do. Still, it's easy to make use of the program to lower the heat during times your house is typically empty or at night when it's easier to bundle up. According to the Consumer Energy Center, you might save up to 5% on energy costs for every degree the heat is lowered between 60° and 70°F. An open fireplace damper lets the same amount of heated air escape up the chimney as a wide-open 48-inch window lets out. Make sure your flue is closed when you don't have a fire going. In fact, it is a good idea to reduce the number of times you use your fireplace. A roaring fire exhausts over 20,000 cubic feet of heated air per hour to the outside. Just can't resist the coziness of a roaring fire? Experts recommend installing glass doors on the fireplace to minimize warm air leakage and closing the damper when not in use. You might also be interested in a low-cost Chimney Balloon to help better close the damper, which may or may not have a tight seal. 3) Utilize ceiling fans to circulate warm air. Most ceiling fans have a switch for winter use to reverse the blades to a clockwise rotation. This creates an updraft to push the warm air that rises to the ceiling back down. You could potentially save up to 15% on heating costs by simply using this feature. 4) Make sure heating vents are clear. Though simple, ensuring that heavy furniture isn't blocking a vent is worth checking. This is also a good time to clean vents, replace filters, and schedule any needed maintenance for your heating system. 5) Seal leaks and gaps around your home. Especially in the multiple story homes that are a hallmark of rentals and military housing, the "stack effect" is the movement of warm air UP in a building, which then pulls cold air IN through any leaks or gaps in the lower levels. Take some time to apply weather stripping and caulk around exterior windows and openings to help limit this effect. On that note, blocking drafts around doors and windows will also help with cold air seeping into your home. While you may have memories of a grandparents' old-fashioned door draft blocker (a "door snake"), they were on to something. Draft blockers range from kitschy to purely functional and can be found at many home improvement stores. Keep blinds and curtains open during the day to take advantage of the warmth from the sun, then close them at night to better insulate your windows. Tight fitting, insulating drapes are best for this time of year. Don't have double-paned windows? You might DIY some insulated panels. Find directions here, as well as other energy-saving ideas for your windows. 8) Add some layers...to your floor. You can lose 10% of your home's heat through bare floors. Layer it up with some thick rugs or carpeting. While you may be getting after your kids to decide and simply come in or out already, you may also want to shut the doors on any unoccupied or rarely used rooms and close that room's vents to direct heat to the rest of the house. 10) Time to replace insulation? If, in spite of your best efforts, your house stays cold in the winter and hot in the summer, it may be time to replace insulation. Though not neccessarily an easy or cheap fix, it might be both easier and less expensive than you expect. While you can hire an insulation professional, DIY instructions abound if you wish to take on this task yourself. Use the handy visual below to see if you've checked off all the boxes when it comes to keeping your home warm this winter! Links are given for informational purposes only and do not constitute endorsement.